Synthetic polymers are rarely homogeneous chemical species but have multivariate distributions in molecular weight, chemical composition, chain architecture, functionality, and so on. For a precise characterization of synthetic polymers, all the distributions need to be determined, which is a difficult task, if not impossible. Fortunately in most of the cases it is sufficient to analyze a limited number of molecular characteristics in order to obtain the information required for a given purpose. Nonetheless, it is still nontrivial if there exists distributions for more than one molecular characteristic. There have been continuing efforts to solve the problem. One approach is to find chromatographic methods sensitive to one molecular characteristic only. In favorable cases, the effect of all but one molecular characteristic can be suppressed to a negligible level. Various interaction chromatographic techniques as well as size exclusion chromatography are employed for the purpose. Also the multiple detection methods each sensitive to a specific molecular characteristic can provide additional information. 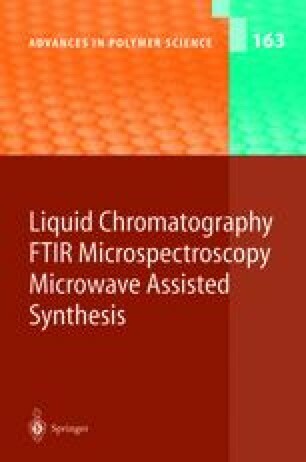 Various detection methods developed recently such as FT-IR, FT-NMR, and mass spectrometry brought about significant progress in the characterization of complex polymers. This review presents the recent developments in the analysis of various heterogeneities in synthetic polymers by a variety of liquid chromatographic separation as well as detection methods.